Where to Buy BioGain Plant Nutrient, BioGain WSP Biostimulant Plant Nutrient - 10 x 0.25 Lb - $118.95 for Sale with Fast Free Shipping! 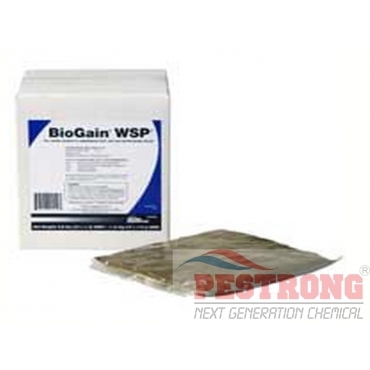 BioGain WSP Biostimulant Plant Nutrient - 10 x 0.25 Lb is an easy-to-use water soluble packet that improves plant health and increases turfs ability to overcome stress. It is a unique, dry, water soluble combination of natural humic substances, seaweed extract, and a proprietary blend of natural sugars, vitamins, amino acids, and beneficial bacteria necessary for healthy soil chemistry. A biostimulant is an industry term used to describe products derived primarily from natural ingredients such as organic materials. When applied in small quantities, they enhance plant growth and development, and the response cannot be attributed to application of traditional plant nutrients. Use Rates: For golf applications, use 1 WSP (0.25 lb) per acre per week. Alternatively, use 2 WSP (0.5 lbs) per acre every 2 weeks. Use Suggestions: Use with every greens and tees application as an additive to your fungicide and nutrient application. Use immediately following aeration or verticutting for improved recovery. Use at seeding, sprigging, or sod installation for assuring a quick start to newly established turf. Works great. It is easy to apply thanks to the water soluble pack.